A unique and highly effective home workout program that encourages you to adventure and explore. This is the perfect workout plan for summer; 4 intense days of Fitness Blender videos, with the 5th day of training being an independent “Adventure” workout. The strategically scheduled FB workouts have everything you need to get a fit, healthy body; lean muscle building strength training for the entire body, fat burning HIIT/cardio, stretching for flexibility, and more. The 5th session of the week is a #FBAdventure workout and what you do is completely up to you; it should be something that you enjoy and that has you moving - preferably outdoors, but the details are up to you. You'll never have a chance to get bored with this program as you'll literally be doing a unique workout video every single day. What counts as a #FBAdventure workout? Workouts are scheduled four days a week, and average out to 36 minutes a day. The only equipment the routines use is dumbbells. We encourage you to use #FBAdventure on social media to log not only the completion of your regularly scheduled FB workouts in the program, but also the workouts that you do for your “Adventure” day. It’s a great way to share your progress, motivate others, find inspiration, and show people your corner of the world, as you hike, walk, bike, run, compete, climb, and generally play your way fit. Make sure to take "before and after" photos so that you can see the difference in 4 weeks! 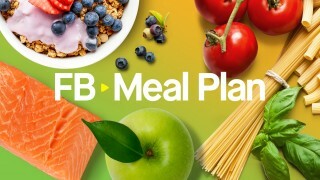 We encourage you to use our Community or #FBadventure and #fitnessblender on social media to track your workout sessions, share your progress, find motivation, and connect with people around the world who are following this program.